In Italy fresh cheeses are a given, and a strong tradition of making and eating them daily means every little cheese shop has them, as well as a resident cheese maker. Hand-formed tender mozzarella. Just-drained ricotta. It all sells out by noon, and the next morning it is made again. Fresh artisanal ricotta cheese — the real thing, not the supermarket version, which is not a reasonable facsimile — can be a divine. Sweet and creamy on the tongue, yet light, it is one of life’s simple luxurious pleasures. 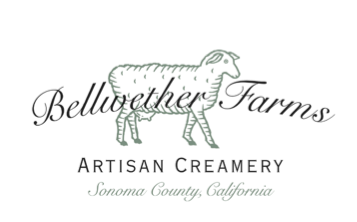 At Bellweather Farms whey from sheeps milk is drained into little Italian baskets to make this delicate delight. Their sheep are a Northern European breed called East Friesian, among the best milk producing sheep in the world. Taller than ordinary sheep, they’re known for their relatively long and pointy ears. 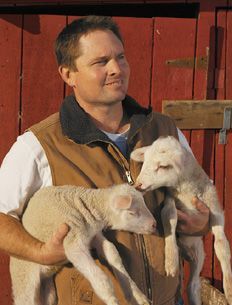 But sheep milk isn’t easy to come by – giving less milk than a cow or goat, they average about ½ gallon a day. Take note: fresh ricotta does not keep. The luscious fresh flavor is fleeting, replaced all too soon by an off, sour one. This cheese should be eaten immediately.